A flow diagram of the main steps of the proposed segmentation algorithm: initialization (A–C), iterative updates of the estimate (D–G), and convergence (H-J). When cells are sufficiently far apart we can segment them independently, in this example, we focus on the isolated cell in the dashed box on the maximum intensity image in A. We make an initial estimate of the cell interior, from which we form the corresponding narrowband (B) and level set function ϕ (C). Based on the discrepancy between a pixel’s time course and the time courses of the interior and narrowband regions (D), we calculate the velocity of ϕ at each pixel (E). ϕ Evolves according to this velocity (G), which updates the location of the interior and narrowband (F). Final results for: one cell (H), the average signals from the corresponding interior and narrowband (I), and segmentation of all four cells (J). ABLE detects cells with varying size, shape, and baseline intensity from mouse in vivo imaging data. The 236 detected ROIs are superimposed on the mean image of the imaging video (A). Extracted neuropil-corrected time series and corresponding ROIs are displayed for a subset of the detected regions (B). Cells with both stereotypical calcium transient activity (B, 1–9) and saturating fluorescence (B, 10–12) are detected. The performance of ABLE does not deteriorate due to intensity inhomogeneity: ROIs with baseline fluorescence from beneath the video median to just below saturation are detected (C). The area of detected regions varies (D) with the smallest ROIs corresponding to cross-sections of dendrites (E). Neighboring regions with sufficiently high correlation are merged (F), those with lower correlation are not merged (G). In F, we plot the ROIs before and after merging along with the corresponding neuropil-corrected time courses. In G, we plot the separate ROIs and the neuropil-corrected time courses. The proposed method naturally facilitates neuropil-correction, the removal of the weighted, local neuropil time course from the raw cellular time course (H). ABLE demixes overlapping cells in real and simulated data. With high accuracy, we detect the true boundaries of overlapping cells from noisy simulated data, the detected contours for one realization of noise with SD (σ) 60 are plotted on the correlation image in A. Given an initialization on a fixed grid, displayed on the mean image in D, we detect the true cell boundaries with success rate of at least 99% for σ < 90 (B). The central marker and box edges in B indicate the median and the 25th and 75th percentiles, respectively. For noise level reference, we plot the average time course from inside the green contour in A at various levels (C). 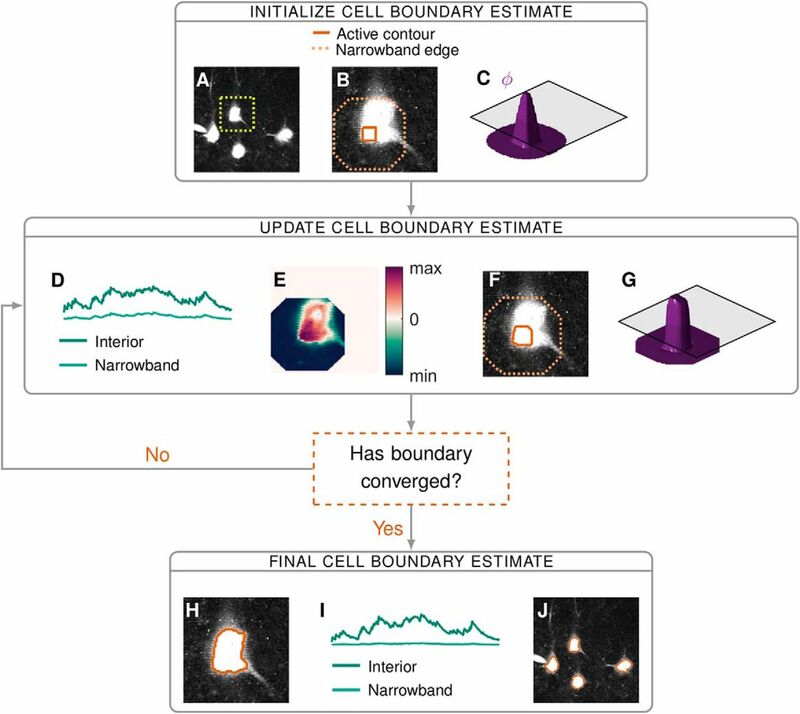 ABLE demixes overlapping cells in real GCaMP6s mouse in vivo data, detected boundaries are superimposed on the mean image (E, F) and correlation image (G), respectively. ABLE detects synchronously spiking, densely packed cells from mouse in vitro imaging data. The boundaries of the 207 detected ROIs are superimposed on the thresholded maximum intensity image (A) and the correlation image (D). For all correlation data we use Pearson’s correlation coefficient. ABLE detects ROIs that exhibit high correlation with the background (C) and neighboring synchronously spiking ROIs (B). B, Neuropil-corrected extracted time courses of the 207 ROIs (each plotted as a row of the matrix) along with the video mean raw activity and the time points of the electrical stimulations. C, Histogram of the correlation coefficient between the mean raw activity of the video and the extracted time series of each ROI. ABLE detected both active (E-G) and inactive ROIs (H, I). We display the contours of the two detected ROIs on the correlation image (E, H), the mean image (F, I) and the corresponding extracted time courses (G, J). We compare the segmentation results of ABLE, CNMF (Pnevmatikakis et al., 2016), and Suite2p (Pachitariu et al., 2016) on a manually labeled dataset from the Neurofinder Challenge. On the correlation image, we plot the boundaries of the manually labeled cells color-coded by the combination of algorithms that detected them (A), undetected cells are indicated by a white contour. Suite2p detected the highest proportion of manually labeled cells (B), whereas ABLE had the lowest fall-out rate (C), which is the percentage of detected regions not present in the manual labels. 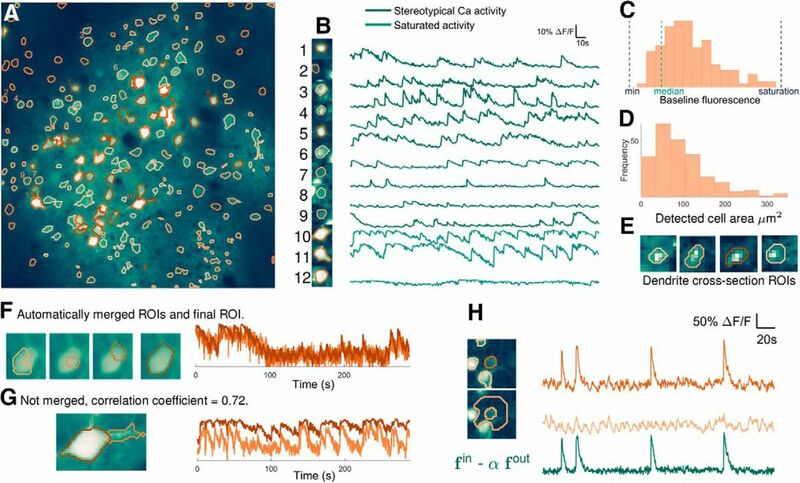 Some algorithm-detected ROIs that were not present in the manual labels are detected by multiple algorithms (D) and have time courses which exhibit stereotypical calcium transient activity (E). The correlation image in D is thresholded to enhance visibility of local peaks in correlation. In E, we plot the extracted time courses of the ROIs in D.
Spikes are detected from ABLE-extracted time courses with high accuracy. On an in vitro dataset (21 imaging videos, each 30 s long), we demonstrate spike detection performance compared to electrophysiological ground truth on time courses extracted from cells segmented by ABLE. We plot the labeled cells (A) and corresponding boundaries detected by ABLE (B) on the mean image of one imaging video. The extracted cellular time courses and detected spikes are plotted in C. Spike detection was performed with an existing algorithm (Reynolds et al., 2016; Oñativia et al., 2013). On average over all videos, 78% of spikes are detected with a precision of 88% D.
On synthetic data with dimensions 512 × 512 × T, the runtime of ABLE (minutes) increases linearly with the number of cells and is not significantly affected by increasing number of frames, T. Runtime was measured on a PC with 3.4 GHz Intel Core i7 CPU. 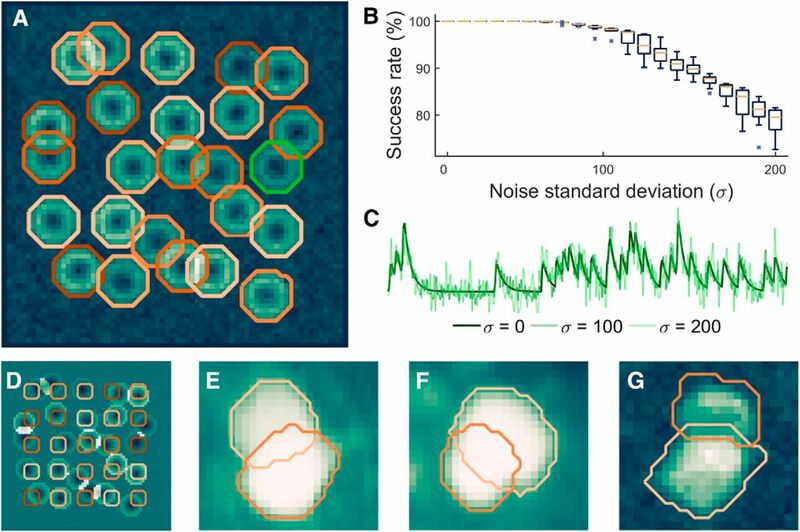 On synthetic data the average number of iterations to convergence, over 100 realizations of noisy data, marginally increases as the number of cells in a given cell’s narrowband (“neighboring cells”) increases. On a manually labeled dataset from the Neurofinder Challenge, we compare the performance of three segmentation algorithms: ABLE, CNMF (Pnevmatikakis et al., 2016), and Suite2p (Pachitariu et al., 2016), using the manual labels as ground truth.